As I've mentioned before, the term "favorite" is not really an absolute concept in my book, but more accurately, a rough description of whatever it is I happen to be eating or creating at the moment. While that luscious spinach tahini salad of a few months ago was a nice favorite for winter, my new favorite salad is appropriately light, fresh, and spring-y. I'm still waiting for the weather to catch up with my salad preferences, but I'm optimistic. Really, I am. I'll try not to consider the possibility that, in true New England fashion, spring has come and gone in the time it took me to write that last sentence. My Slanted salad was an enticing mound of carrot, jicama, cabbage, grapefruit, sprouts, and candied pecans, and today's salad is similar. I skipped the candied pecans in favor of simple roasted and chopped ones, and left out the grapefruit (I wanted to save those for breakfast). I also garnished the dish with some fresh mint, and to make it more substantial fare, served it over a bed of brown rice stick noodles. I will warn you that it is possible to eat virtually infinite amounts of this salad; the dressing is a very light combination of lime juice, fish sauce, vinegar, and sugar, and cabbage and jicama aren't exactly the most filling of foodstuffs. I see this more as a bonus, though: more tasty deliciousness, less yucky fullness. On a warm evening or a sunny day, this salad, perhaps with a few grilled shrimp, is just right. Without a mandoline or other vegetable slicer, this dish is a bit labor-intensive, but if you are like me and love the detailed precision involved in chopping vegetables into matchstick-sized pieces, the salad will be a breeze to prepare. Besides, rice stick noodles couldn't be easier to make: just soak in hot water for a few minutes, and they are ready to go. I like to make a big batch of this salad, because a) it's yummy and b) it gets better as it sits in the fridge. In fact, I would let it sit for at least an hour or so before serving. 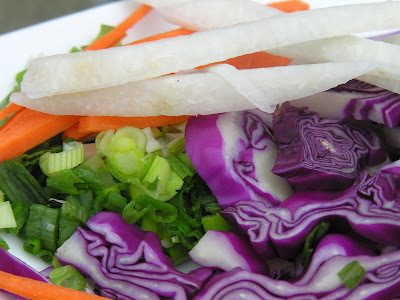 Like all cabbage salads and slaws, it takes a bit of time for the dressing to soak and soften the raw vegetables. A couple of notes: the toasted pecans are what truly make this salad; the combination of sweet, tart, crunchy, and briny is perfectly offset by their subtle, nutty richness. I like to chop them into small pieces, so that they cling to the veggies and find their way into each and every bite. 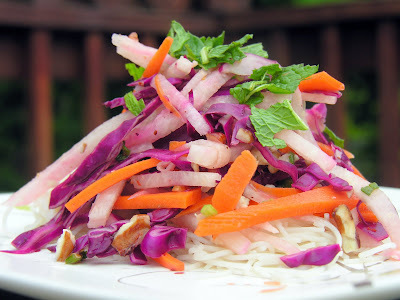 The dressing for the salad is a classic Vietnamese combination, and makes use of Vietnamese or Thai fish sauce, which is available in most supermarkets. 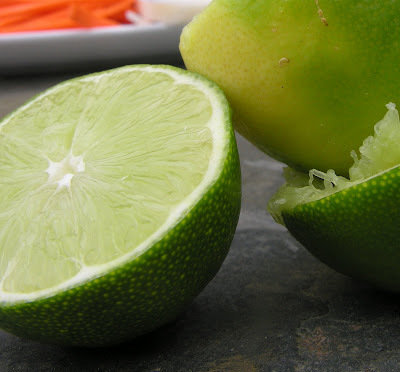 Use fresh limes for the juice. Trust me. If they are stubborn, stick them in the microwave for a few seconds and roll them on the counter before slicing and juicing. And whatever you do, don't skip the jicama. If you've never used it before, you should. It looks like a big bulb, and you have to peel the rough skin before slicing. 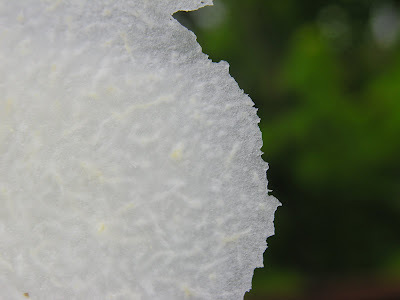 It is slightly sweet and very crunchy, almost like a mild, root-y apple. Besides, it's so pretty! If you are enticed by the idea of Vietnamese food, by all means, fly to San Francisco and make a reservation at the Slanted Door. If that isn't an immediate option, though, definitely try my new favorite salad. Core the cabbage and slice as thinly as you can. Peel and julienne (cut into matchsticks) the carrots and the jicama. Chop the green onions. Mix the vegetables and the pecans together in a large bowl. Prepare the dressing: mix all ingredients in a small bowl, and whisk until combined and sugar is dissolved. Taste and add chili paste, honey, salt, or pepper as you see fit. The dressing should be light, tart, and slightly briny from the fish sauce and vinegar, but not overpowering. Pour all of dressing over vegetables, and toss to combine. Let the salad sit for an hour or so, or refrigerate overnight before serving. 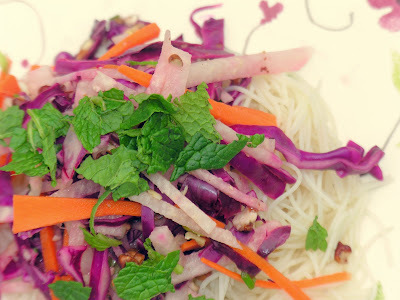 Serve over brown rice stick noodles or alongside grilled meat or fish. Garnish with mint leaves and additional green onions or pecans, if desired. Mmmh, looks delicious! I love jicama (or turnip, as we know it). Yes, the best Vietnamese restaurant in the country to Americans. Slanted Door is overrated and inauthentic.